NGC 6826's eye-like appearance is marred by two sets of blood-red 'fliers' that lie horizontally across the image. 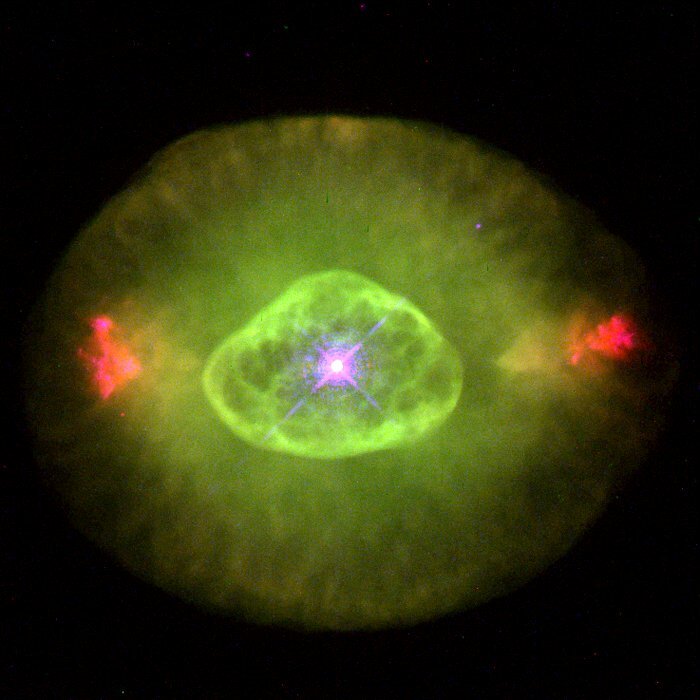 The surrounding faint green 'white' of the eye is believed to be gas that made up almost half of the star's mass for most of its life. The hot remnant star (in the centre of the green oval) drives a fast wind into older material, forming a hot interior bubble which pushes the older gas ahead of it to form a bright rim. (The star is one of the brightest stars in any planetary.) NGC 6826 is 2, 200 light- years away in the constellation Cygnus. The Hubble telescope observation was taken Jan. 27, 1996 with the Wide Field and Planetary Camera 2. Position (Dec): 50° 31' 31.45"